2016 China (Henxian) Jasmine Cultural Festival, sponsored by China Tea Marketing Association, supported by China Flower Association and undertaken by Hengxian People’s Government and Flower Professional Board of China Flower Association, had its opening ceremony in Hengxian on Aug 22. With the theme of What a Beautiful Jasmine, the Festival was held from Aug 21 to 24, including such activities as 2016 China (Hengxian) Taobao Jasmine Culture Festival, Quality Assessment Result Release of 2016 National Jasmine Tea Products, Analysis for 2016 Jasmine Tea Production and Marketing & Guangxi-Taiwan Tea Industrial Development Seminar, Hengxian Press for Choosing China Top 10 Brands of Jasmine Tea, Hengxian Jasmine Products Creation Competition and Show, Special Tourism-with love of jasmine. Hengxian has held nine national jasmine tea trade fairs and six China (Hengxian) Jasmine Cultural Festivals since 2000. Compared with the previous ones, this year’s Festival revealed some new sparks and growing trends as e-commerce platforms of Rural Taobao, Lecun Taobao and Village Post Tesco had been introduced since last July to boost the development of local e-commerce. 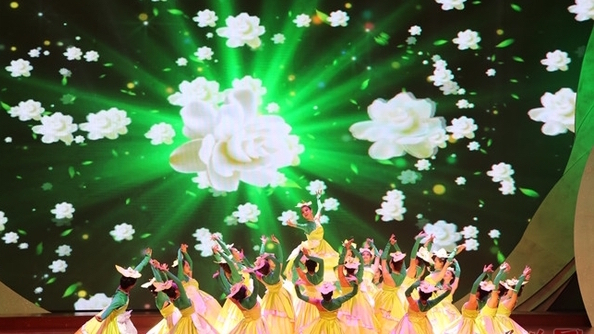 During this Festival, the county held Online Jasmine Cultural Festival through Alibaba Platform at the same time. As present, the good-will of Hengxian Jasmine Tea Brand is close to 8 billion yuan.